Phosphorus is an essential plant nutrient, but too much can cause excess aquatic plant growth and algal blooms. High levels of phosphorus act as a fertilizer and create an environment where growth is unnaturally rapid. This deprives aquatic animals of vital dissolved oxygen and will speed up the life cycle of a lake through the build up of plant and algal matter. When a water body becomes over loaded with nutrients (a process called eutrophication) the excess nutrients support the growth of plants and algae. Eutrophication is often caused by runoff of phosphate containing detergents, fertilizers, or sewage to an aquatic system. Fertilizers – use non-phosphorus and/or slow release nitrogen containing fertilizers on your lawn. Fertilizer products indicate the amount of nutrients using three numbers on the container. These three numbers represent the primary nutrients (nitrogen(N) – phosphorus(P) – potassium(K)). This label, known as the fertilizer grade, is a national standard. A bag of 10-10-10 fertilizer contains 10 percent nitrogen, 10 percent phosphate and 10 percent potash. Lawn Care – Keep all grass clippings and leaves out of the lake by bagging them for curbside pick up. Lawn waste will break down in the lake and increase sedimentation on the lake bottom and release additional nutrients into the water. 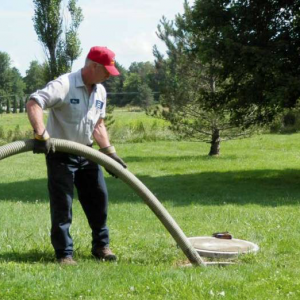 Septic Systems – Proper maintenance of septic systems reduces the amount of phosphorus entering the lake. Certain nutrients build up in organic waste from your home and are dissolved in the water that ends up in the leach field. The nutrients that do not get filtered out eventually drain into the water table below the ground or drain into the lake. Pump Out Stations – Pump out stations are located at one marina on the Lake. Pumping out boat holding tanks eliminates pollution from organic waste that degrades water quality. Weed Harvesting – Harvested weeds represent significant biomass and nutrients, that if not removed would add to future eutrophication of the Lake. Stormwater Runoff – As stormwater flows across streets, sidewalks, and lawns it can pick up harmful pollutants and push them into storm drains and surface water. These pollutants can include lawn and garden fertilizers, pet waste, sand and sediment, chemical contaminants and litter. Check the labels of products used in and around your home and use phosphorus containing fertilizers, detergents, and chemicals sparingly. They may eventually reach the lake. Consider leaving a wide strip of deep rooted native plants along the shoreline to prevent soil and nutrients from washing into the lake or planting a rain garden.